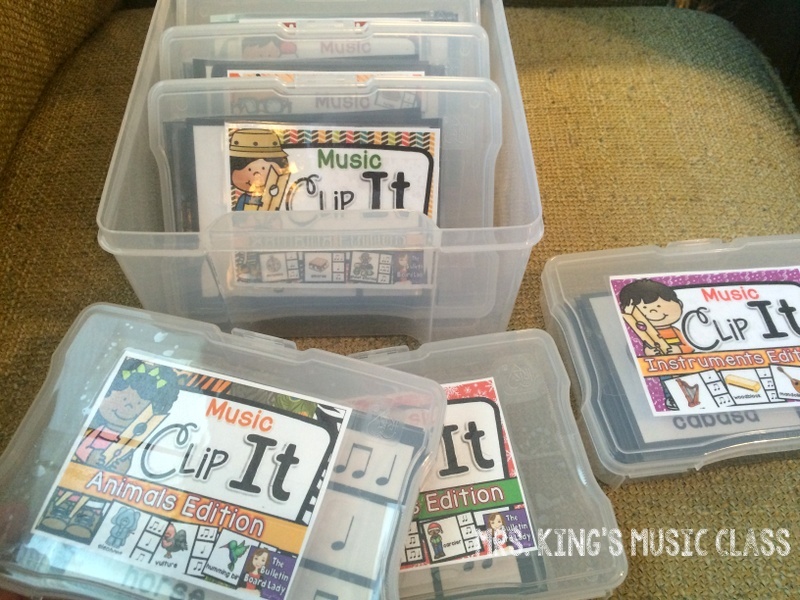 I am thrilled to introduce a few new workstations to my classes this week. December is such a fun time and I love that I can present such fun ways to assess their skills before winter break and then end of the quarter. 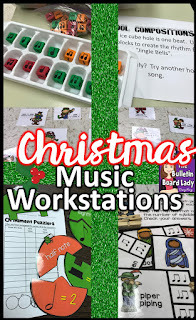 Keep reading for ideas for Christmas music workstations that really work! 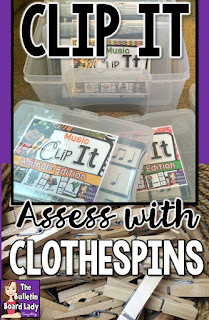 You probably know from previous blog posts that I am a big fan of Clip-It activities and so are my students. This set of Christmas Clip-It cards contains both sacred and secular images including Santa, the nativity, the twelve days of Christmas and more. 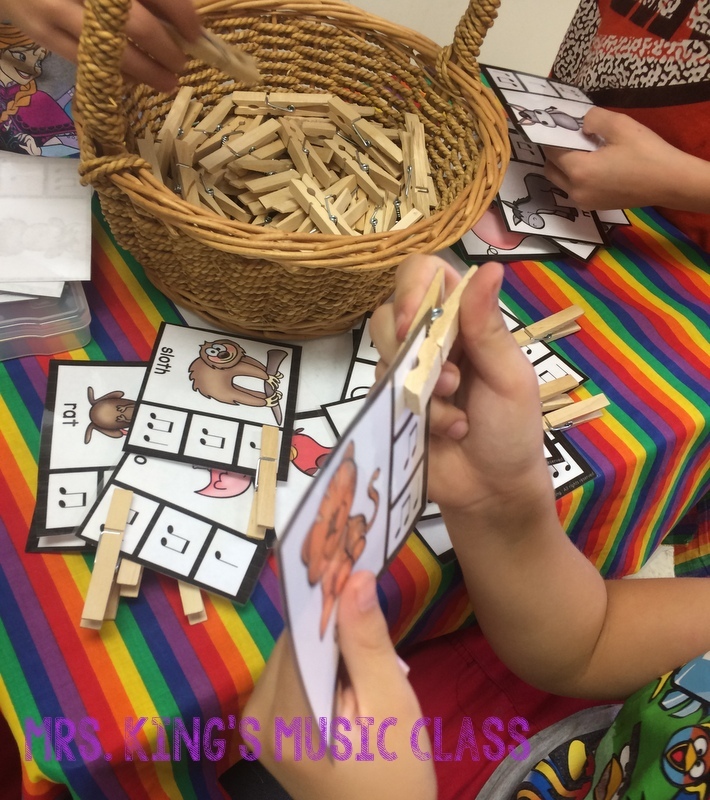 Students clip the rhythm that matches the syllables in the picture. I have an answer sheet that I include, but sometimes I just let the students check each other's answers. Read more about Clip-It games HERE. I have a set of Christmas Workstations in my store and this Swat the Rhythm game is from that collection. Students lay down the cards and two students choose a flyswatter. Another student claps one of the rhythms on the card and the first one to swat the correct rhythm is the winner. FUN! 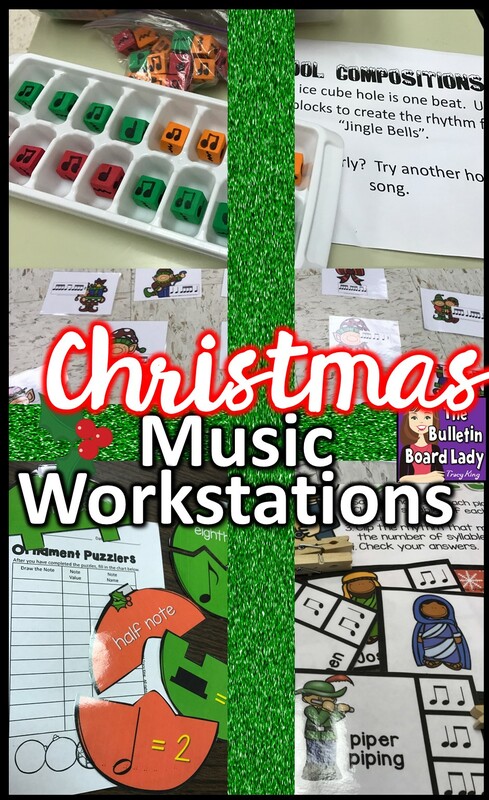 Also from the Christmas Workstations set is this Frozen Instrument Families word find. I have found that it helps to mix up the stations so that students are physically active at some and rest and work quietly at others. 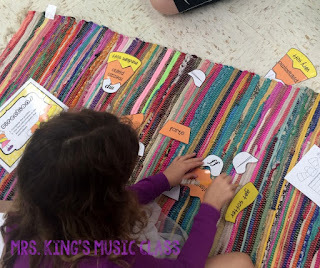 This quiet center is a great way to review instrument spellings and instrument families. 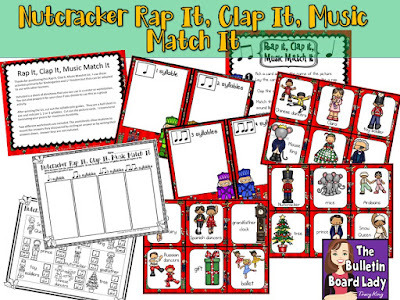 Nutcracker activities are also wonderful to include in workstation rotations this time of year. Although this Rap It, Clap It, Music Match It Set could be used any time of year, it works well in this rotation. Students match the cards with the number of syllables in each picture and then complete a worksheet to show what they have learned. You can download it HERE. Cool Composition is a workstation that I use periodically all year long. Sometimes we use it to composer, take rhythmic dictation or in this case, decipher the rhythm of a familiar song. The little cubes are foam cubes from Dollar Tree. 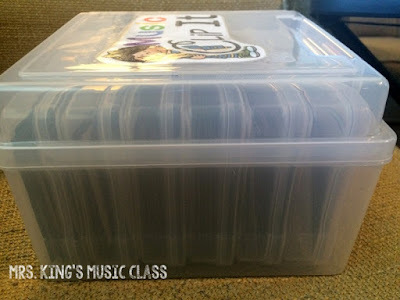 Each side has a 1 beat note/rhythm written on it with a permanent marker. The ice cube trays are made by Rubbermaid. I had to look quite some time to find trays with 16 cubes. This makes the perfect vessel for composing in four-four time. Most ice trays come in 14 cube size. 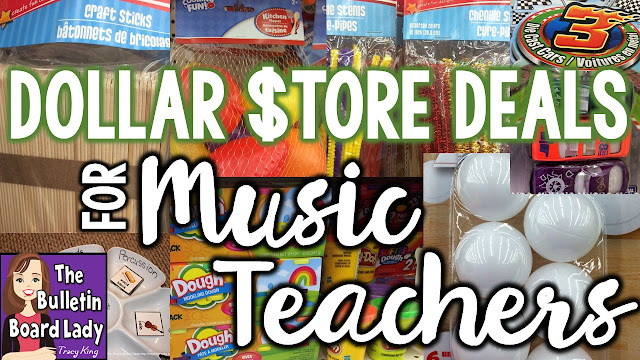 I never really knew that until I started teaching music! 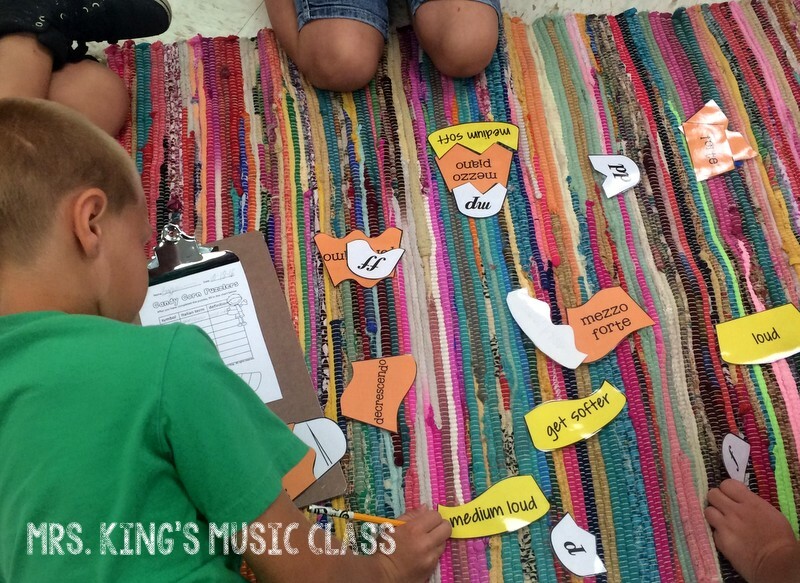 At this station, students are asked to notate the rhythm to "Jingle Bells". Ornament Puzzlers are the next stop in the Christmas music workstation rotation. 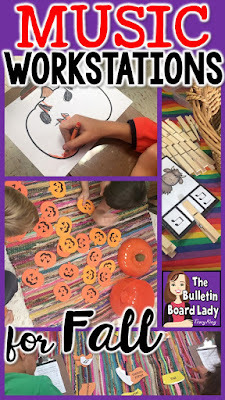 This activity has students put together simple, 2 piece puzzles and then write down the information they have pieced together. 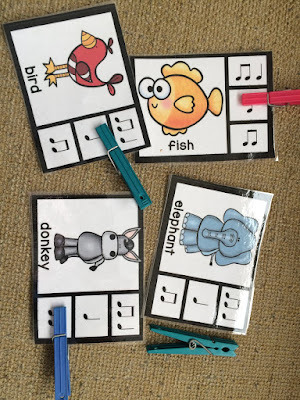 This is a great way to reinforce note values without being to difficult for special learners. You can get these HERE in my store. My students LOVE using dabbers and I love how easy and quick assessment can be when they use them! 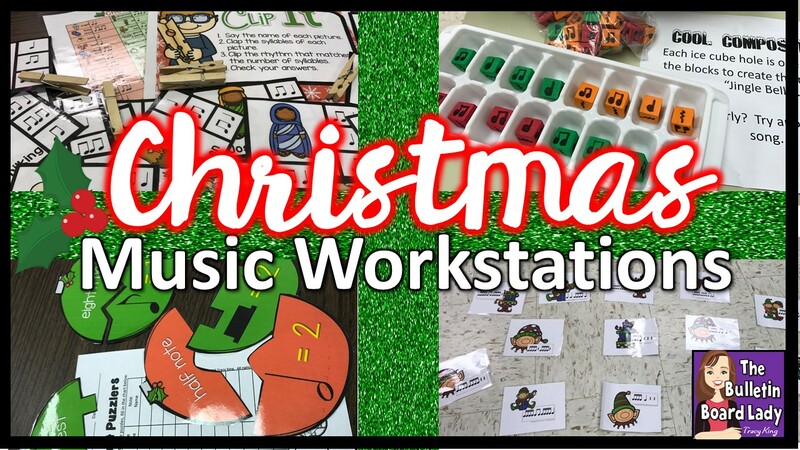 Check out this Dabber Activities Christmas set for many great print and go worksheets to include at a workstation. Students tend to go through these quick so you should probably plan to have 2-3 sheets for them to complete. 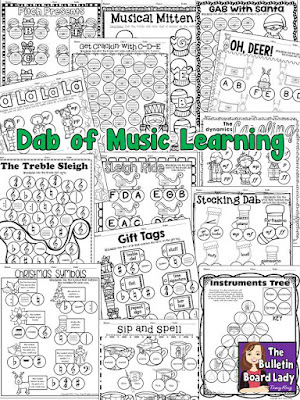 Learn more about using dabbers in music class in this previous blog post. 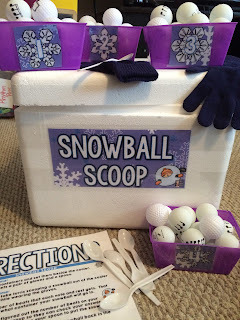 Speaking of previous blog posts, you might want to revisit THIS post about my Snowball Scoop center. 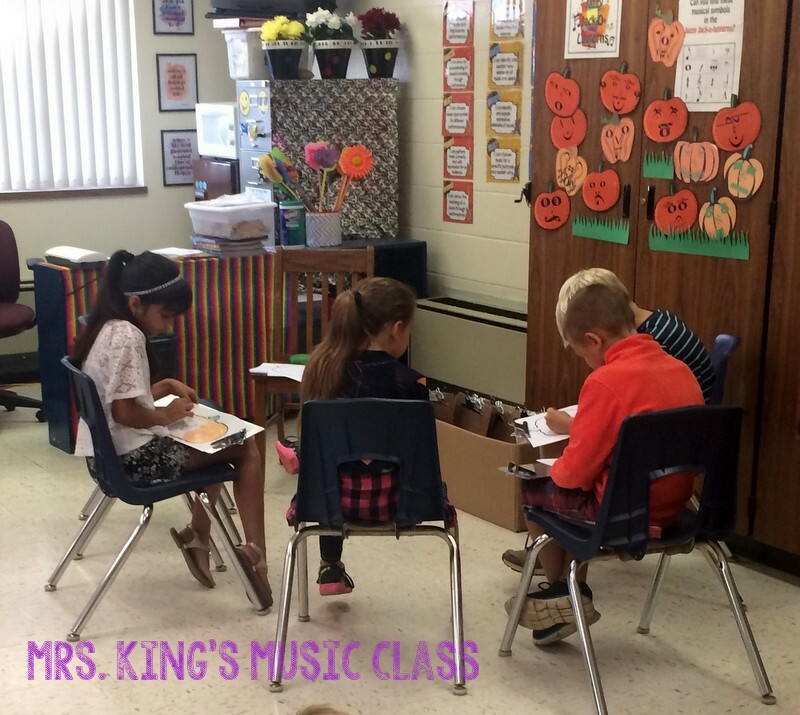 It is such a novelty that students hardly realize they are learning! This year I am teaching in a room that is much smaller than the rooms I have been in for the last 20 years or so. Centers still work perfectly! This is a picture of some of my groups working on centers this fall. For some centers I put down a large throw rug. 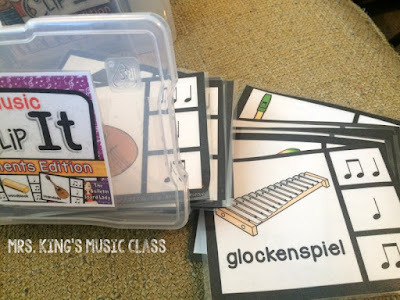 Students can sit on it or do their activity on it. Sometimes using the rug just helps define the space you have designated for the workstation. At this workstation, students say/clap the name of the picture on the card. They decide with rhythm matches the syllables of the picture and clip-it. Each set comes with an answer sheet, but most groups use peer checking successfully. This is actually a bulletin board set that I have used for many years. See it HERE. 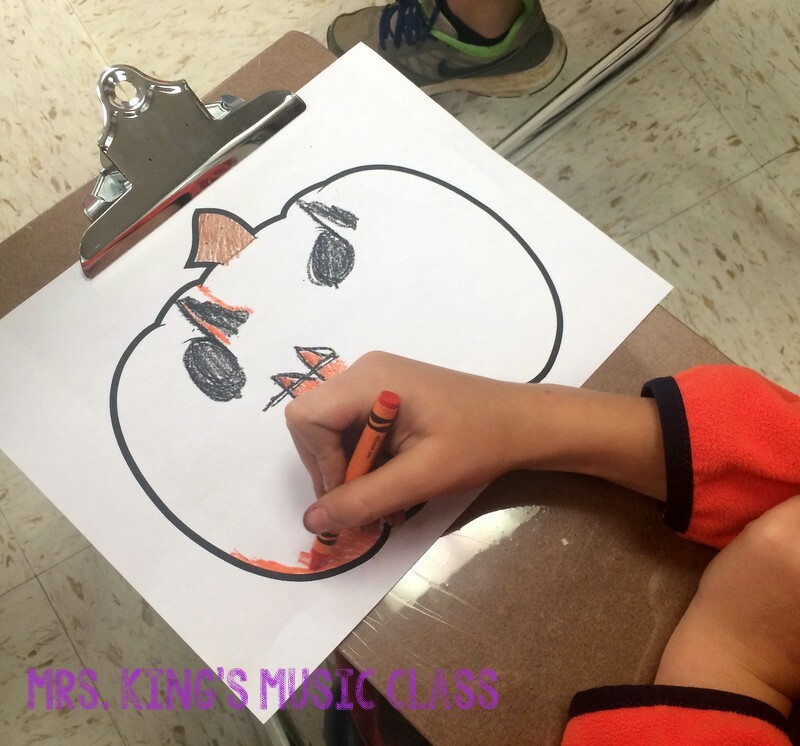 At this station, students get a blank pumpkin and must use only music symbols to create a face on it. I have sometimes just provided blank paper, but students seem to take so much time drawing their pumpkin that they don't get to using the music symbols. A blank template gives them more time for that. You can get the bulletin board HERE. 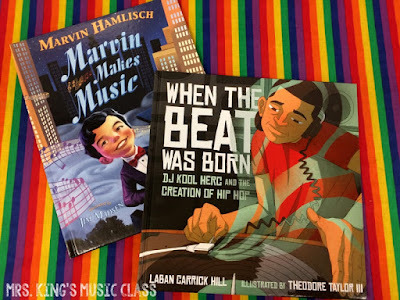 It doesn't come with a blank template, but you can find one online or in a bulletin board book you may already have on your shelf. I found these packs of foam pumpkins at the dollar store about five years ago. I've seen similar ones at Hobby Lobby and Joann's that might work. On the back of each pumpkin I drew a four beat rhythm and on another pumpkin the exact same rhythm. Essentially, this is a memory game. 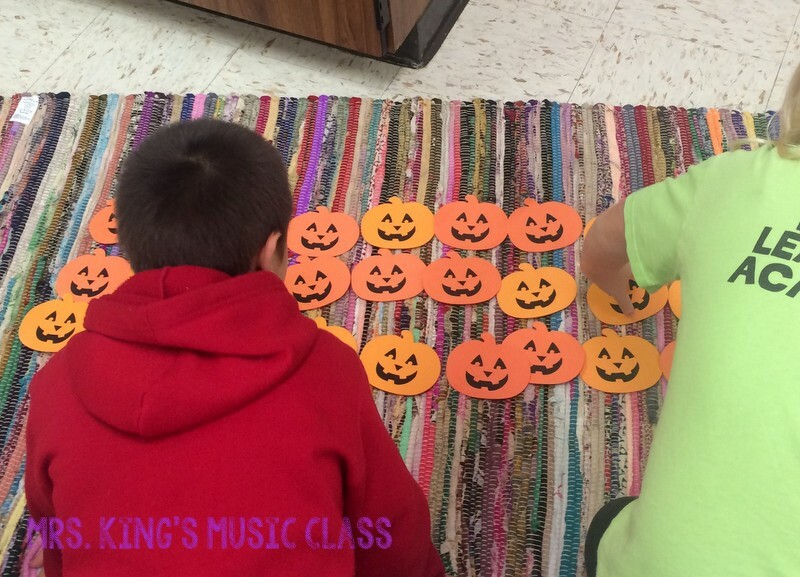 Students turn over a pumpkin, clap the rhythm they see and then try to find its match. If they get it right, they keep the match and if they don't they turn them back over and it is someone else's turn. If at all possible, I like to include a workstation that includes singing or playing an instrument. 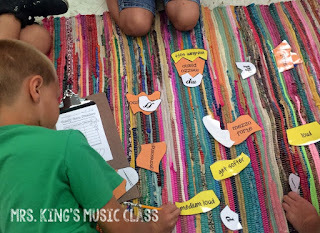 This was the first time my 3rd graders had worked at centers and I wanted to choose something with which they could have immediate success. The rhythms in this file are easy. It includes ta, titi and sh. Actually, the notes aren't used. Icons of rhythm sticks are used instead. 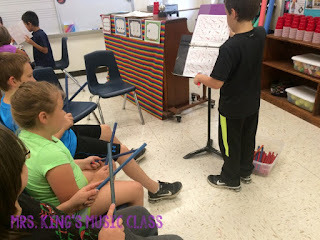 Rhythm sticks are also a nice instrument to start with because they are not particularly loud and annoying. 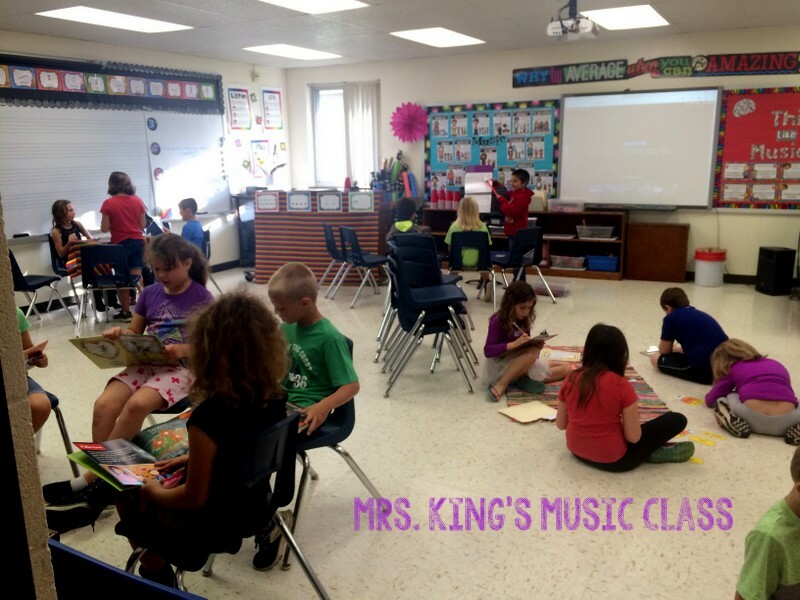 With a classroom full of learners in a small space, this is important! They did a great job and demonstrated a great deal of self control. 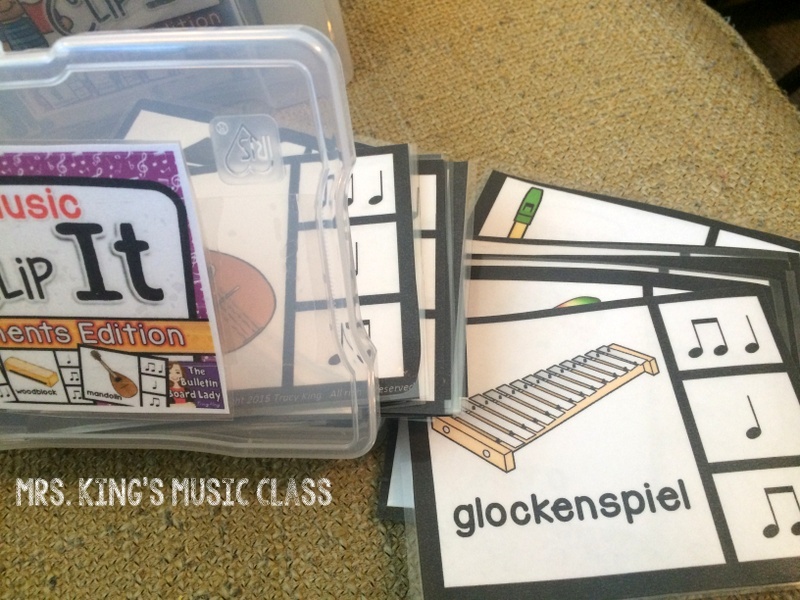 You can find the Rhythm Stick Reading set HERE. 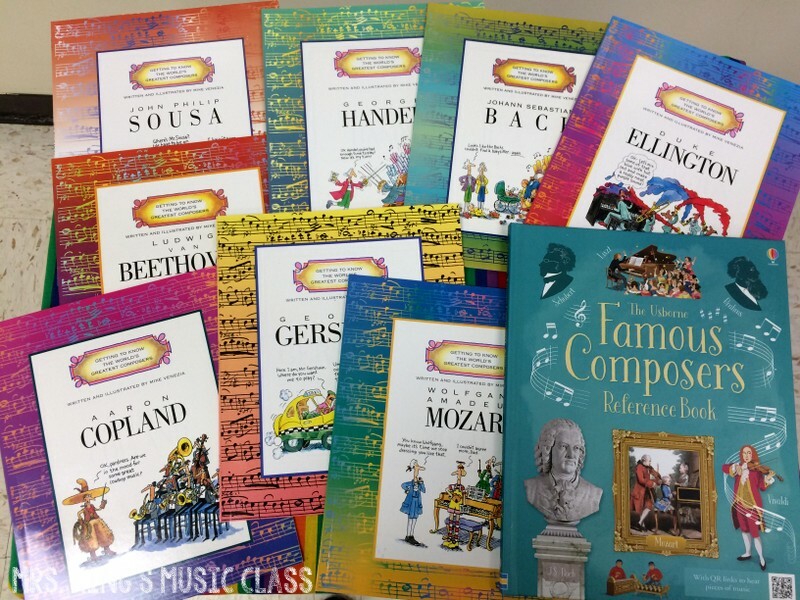 You might also like the one for several different rhythm instruments, maracas, tambourines, hand drums, triangles or cowbells. If you like these ideas, pin them for later! 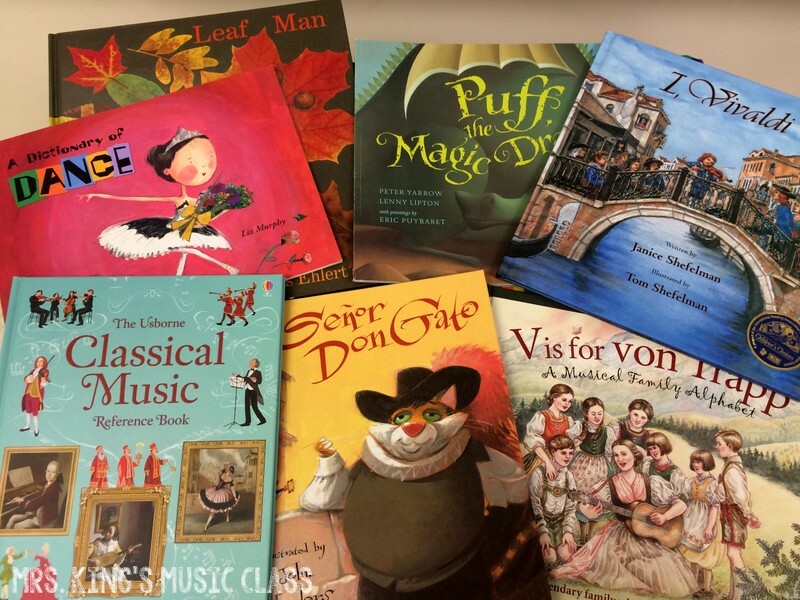 I love incorporating books into my music lessons and I am adamant that I have a classroom library of books that teach about music history, explore music genres and dance, serve as a reference and more. 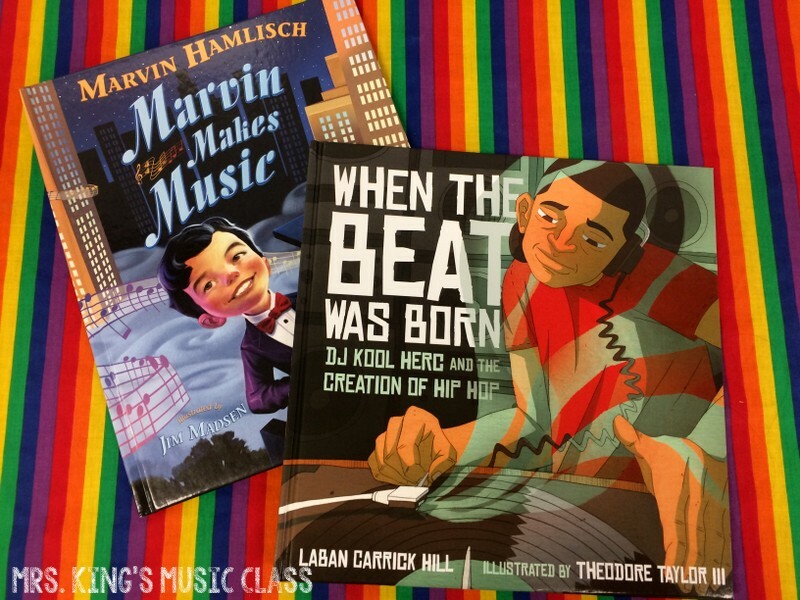 This year I moved to a new classroom that had NO music classroom library. None. Zilch. Since I use a reading station in almost of my workstation rotations, I new I had to do something. I have my own library of books that I've purchased during the last 20 years, so I had a few things to start with but soon realized most of my books were for primary aged students. I'm currently teaching 3rd, 4th and 5th graders and most of the books that I had were for Kindergarten through 2nd grades. Off to Amazon I went! 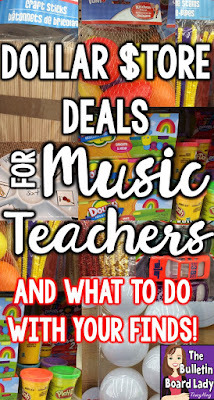 I would love to say that I researched for hours and consulted a stack of teacher resources, but I already had a wishlist a mile long for this age group! 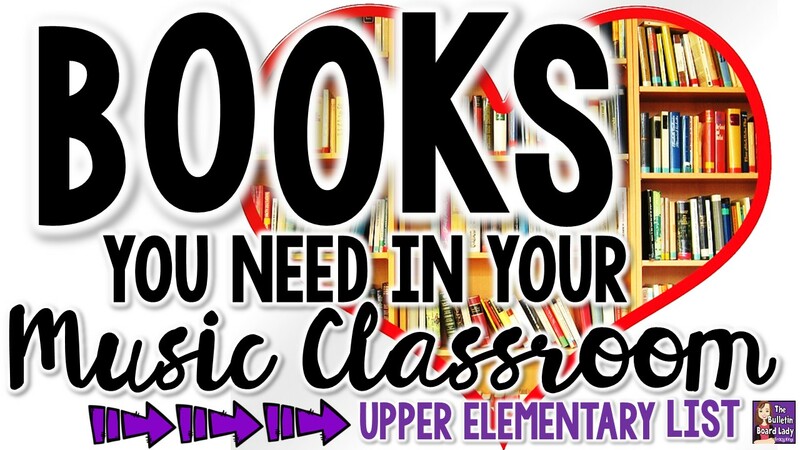 Below you'll find a list of the books I have in my library that are appropriate for upper elementary classes. This list is not even CLOSE to being comprehensive. There are hundreds of books that I could add to this list and more being published every year. 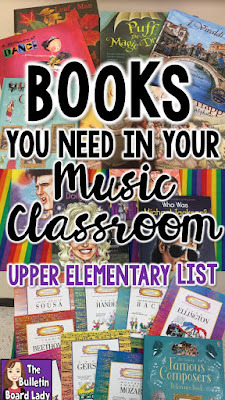 This list may be a good starting point for you if you are building a library for your music classroom. Are you interested in seeing my list for primary classes? Check out THIS blog post. 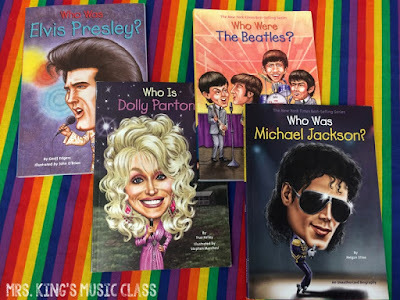 Some of these books are chapter books, so students may only get to read a portion of the book during workstation rotations. 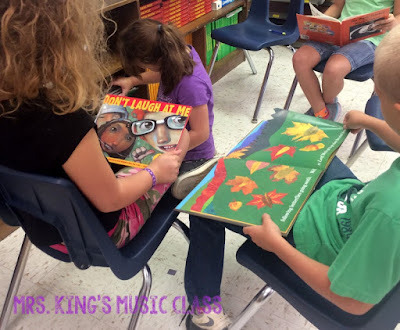 My room is used as a bus room and so students also have the opportunity to read during bus room. I do not lend my books out, but if something is quite popular I let our school librarian know. There are more titles in this series that you might like. Elton John and Bruce Springsteen are a few more musicians you can find. 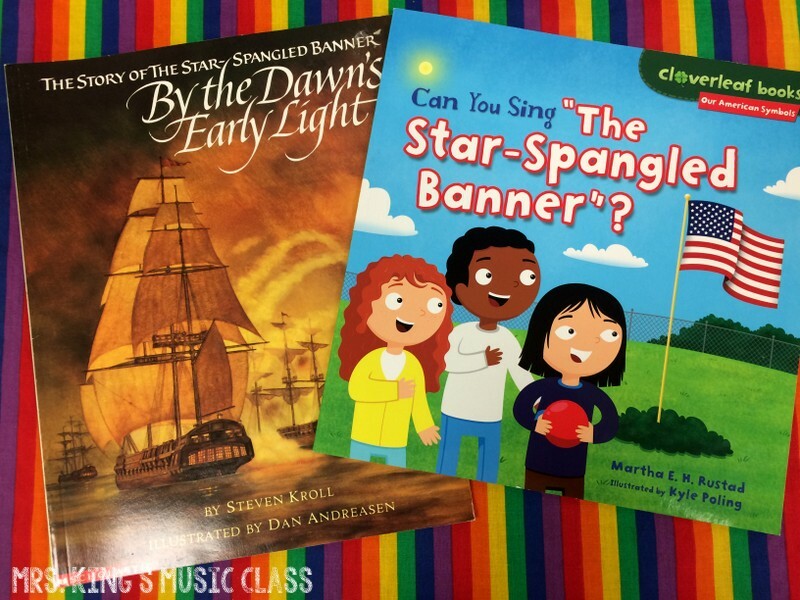 Patriotic I teach a "Star-Spangled Banner" unit and like to have a few books on hand for students who finish early. These are a couple of my favorites. 1. I put my name on the inside of the front cover, on the back cover and inside the book. I use a permanent marker and a paint pen on books with a dark cover. 2. Some of the books have CDs inside of them. 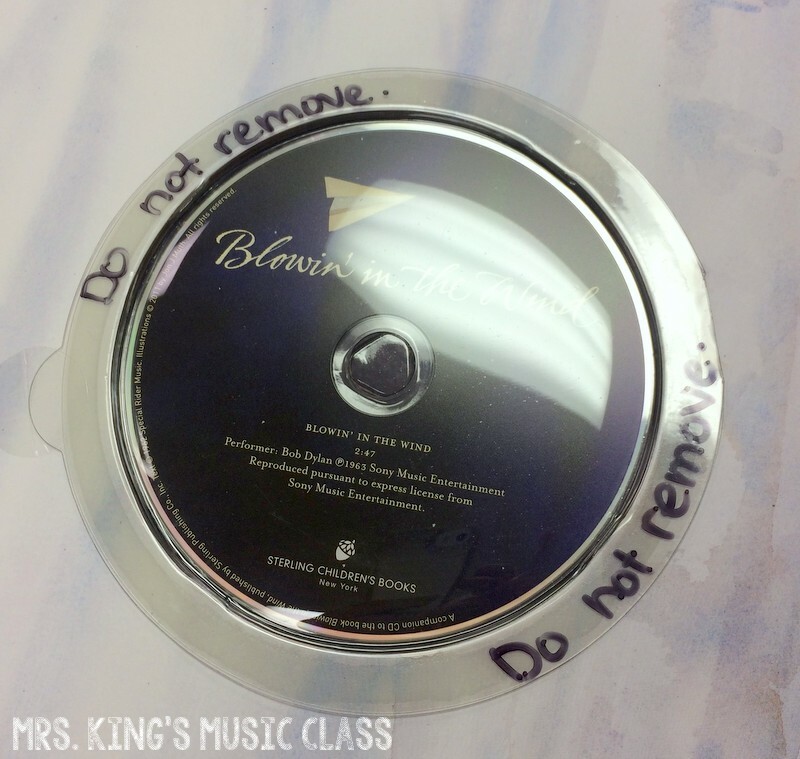 I prefer to keep the CDs in the book, so I tape them in and write "Do not remove." in permanent marker in an obvious place. I must admit that this works great for every class except Kindergarten. *giggle* They rip the CD out and bring it to me so it doesn't get broken. 3. 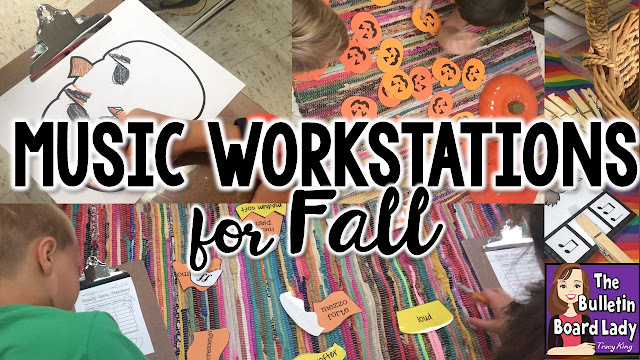 I usually keep my library on a shelf, but you could use milk crates, a rolling cart or even a book bag if you were only going to use them during workstations. I hope that this list is helpful and would love to hear other suggestions for books to add to my library. Leave the title of your favorites for upper elementary classes in the comments. 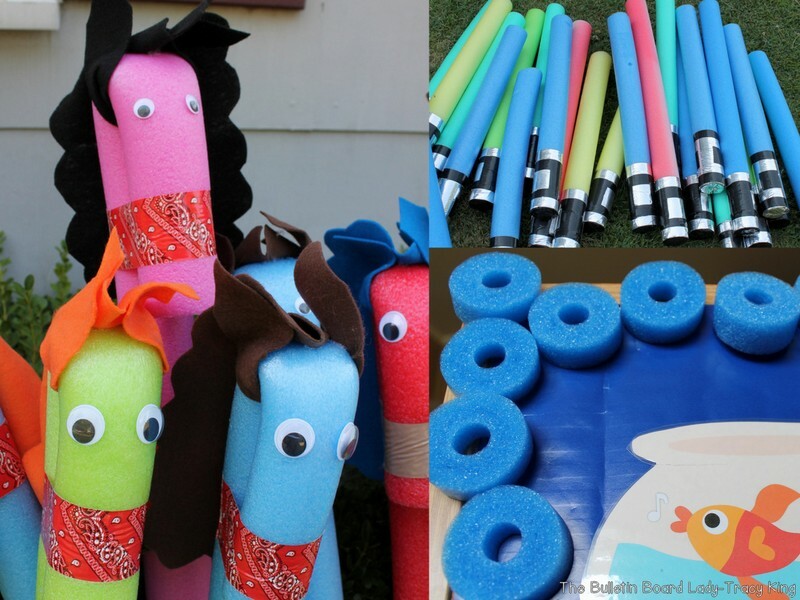 If you liked these ideas, pin this post for later! I have a confession. As a teacher who only sees her students once a week for 50 minutes I struggle with assessment. When 500 students file in and out of your classroom each week it is hard to plan and carryout meaningful assessments. I would much rather be joyfully making music than testing. What I've discovered is so stinkin' easy that I wish I would have known about it twenty years ago! My secret assessment weapon? 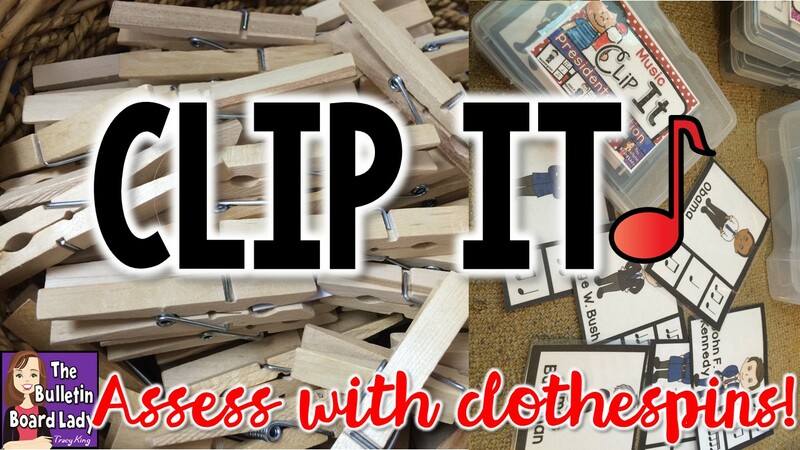 Clothespins. Yep. 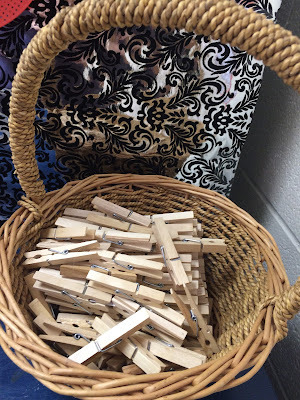 Clothespins. I usually place these Clip It sets in my workstations rotation. I include a sheet for students to use and check themselves. 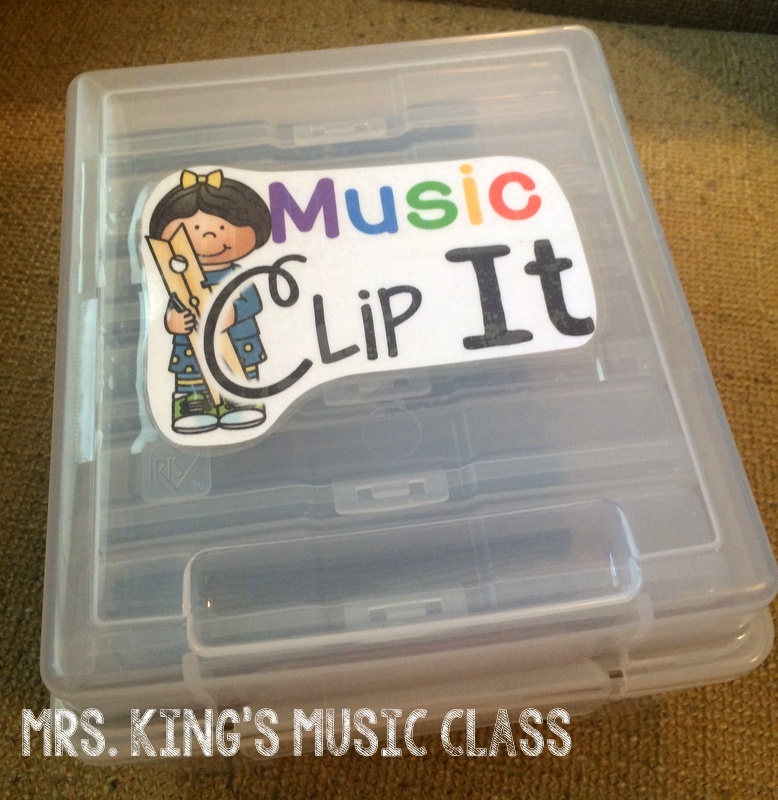 The Clip It sets are quite easy to put together. 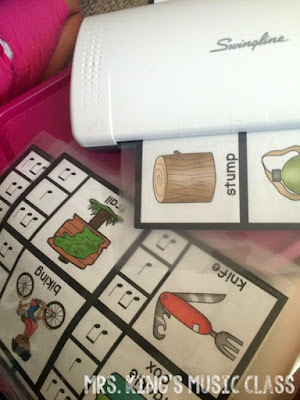 I laminate each sheet as a whole on my personal laminator. Then I cut then out. This saves me lots of extra cutting time and gives them a sturdy finish. I keep a basket (or two) of clothespins for activities like this. I used to buy pretty colored ones, but have discovered that no one fights over the ugly, wooden ones. Students take a card and say the name of the object or person pictured. 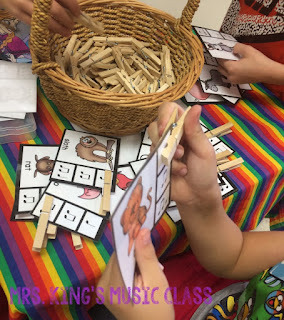 Then they identify the rhythm pattern that most closely matches the syllables in the word and clip it. Students can use the enclosed answer sheet to check their answers. 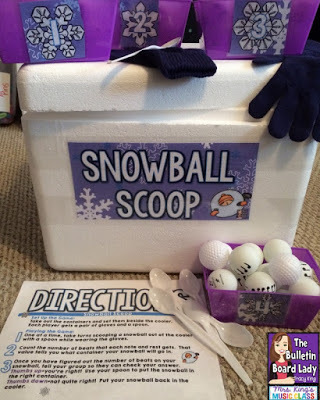 It is also possible for a student to get a zero for this activity. If they refuse to do anything, there is no evidence so there are no points awarded. The cards in these sets are about a fourth of a page. They fit PERFECTLY into photo boxes! I printed out a little label for mine and then sorted the cards into individual boxes. Each themed set is in a different box. I printed the cover page of each set at 25% and used it to label the individual boxes. I can pull out one set to use as a station during our workstation rotations or I can pull them all out and have students work in small groups. Here are some sets that you might find handy. Click each picture to learn more. 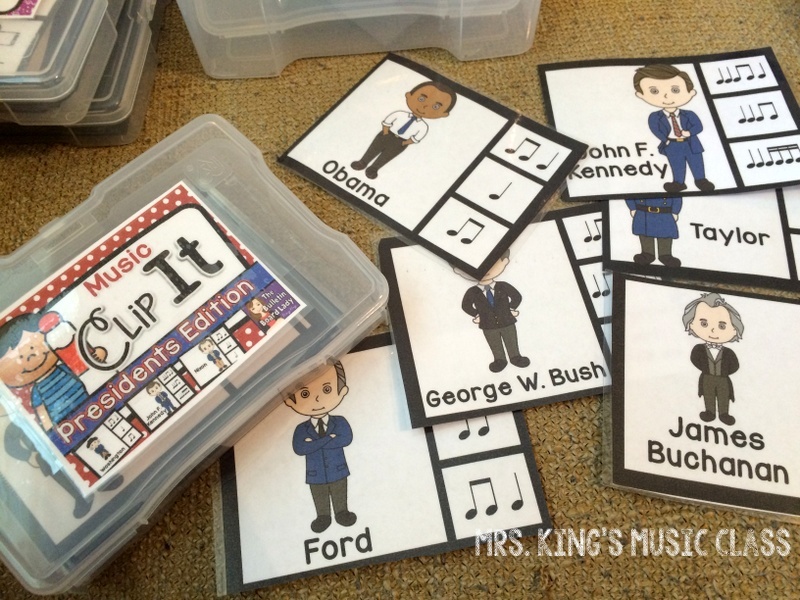 The Presidents Edition includes sixteenth notes and eighth note/16th note combinations. The others are mostly quarter notes, barred eighth notes and quarter rests. I hope that you'll enjoy these activities as much as I do! 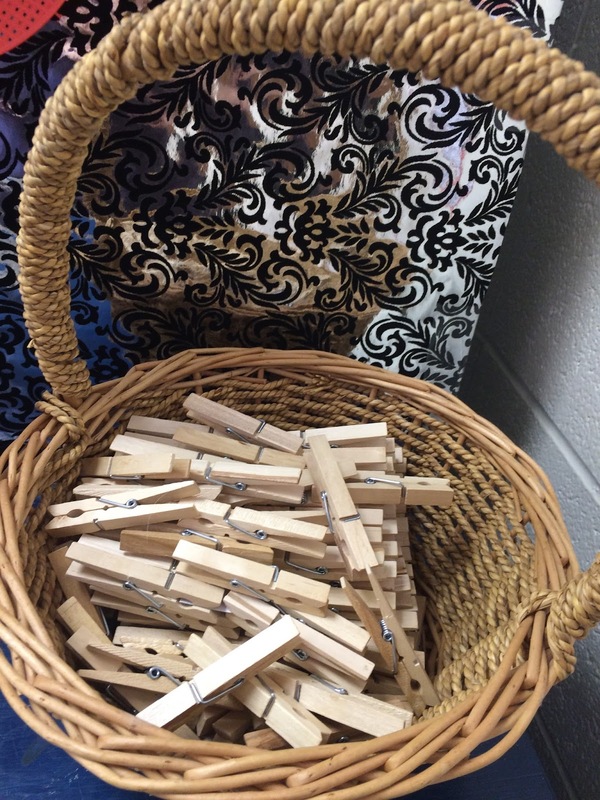 I love the simplicity and I love the way a simple clothespin can keep students SO engaged. It's almost like magic! This picture is from Clip It Animals Edition.